Ahh yes, the wonderfully jolly Christmas season is nearing and that can only mean one thing: London is about to get a whole lot more festive in these next few weeks. 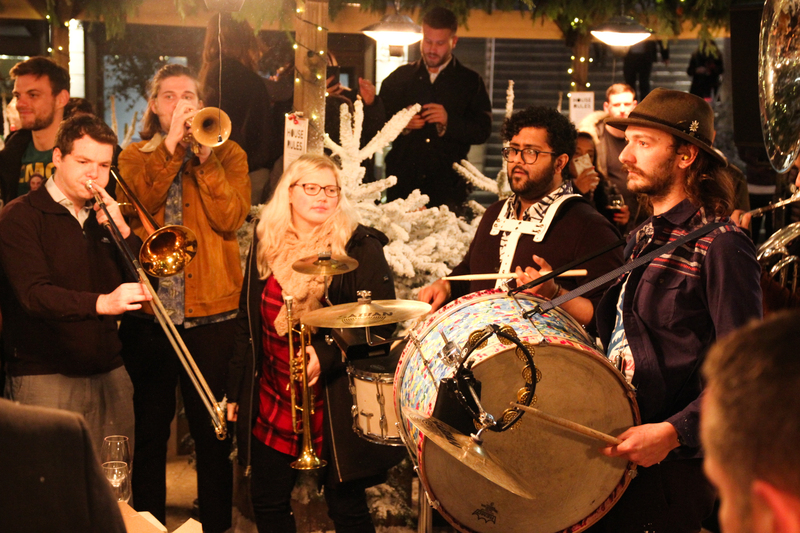 Joining in on these highly anticipated festivities is East London’s Broadgate Circle with the launch of their magical Nordic-inspired pop up The Winter Forest. We were delighted to attend the official launch night last week and be among the first to see this year’s divine set up. Lined with sparkling fairy lights and pine trees covered in fluffy fake snow (300 trees, to be exact), the scene was pretty darn stunning to say the least. Mrs Fogg’s Pop Up Bar sat central to the circle, complete with green hanging holly and Christmas baubles. Warm lighting had the bar glowing from afar and a clear marquee helped to keep in the warmth. The whole thing looked like something out of a Christmas movie, really. However, aesthetic visuals aside, the ambience was truly manifested by all the merry faces buzzing around the space. There was something particularly vibrant about all the neighbouring bars and restaurants uniting to participate in the festivities. Getting stuck into some Christmas themed edibles ourselves, we indulged in an abundance of mulled white wine from Aubaine, mince pie croquettes from Jose Pizarro, far too many slices of pizza from Franco Manca and some delicious baos from Shoryu. Heading to Mrs Fogg’s Pop Up to finish off the night, we were treated to an exciting performance by a big band comprised of trumpeters and a drummer (there had to be at least five or six of them). This particular troupe weren’t any ol’ band either; they played new, ‘hip’ pop music and chart-toppers with their very own big band twist. After playing the likes of Justin Timberlake’s ‘Cry Me a River’ and Rage Against the Machine’s ‘Killing in the Name’ (epic, we know), they dabbled in a few traditional carols to keep the Christmas spirits high. These guys really brought something truly unique to the vibe of the night. Their compelling enthusiasm could simply not be topped! The Winter Forest is open seven days a week from now to the 24th of December and will see a plethora of workshops, live music performances and events take place. To view what’s on, see the official site here… perhaps even Father Christmas himself might make an appearance! If you’d like to watch our IGTV of the night, follow the link here. This was definitely one of the most wonderful introductions to our very first cold Northern Hemisphere Christmas as two Aussies new to living in London – a huge thanks to Bacchus PR for inviting us to experience the magic.